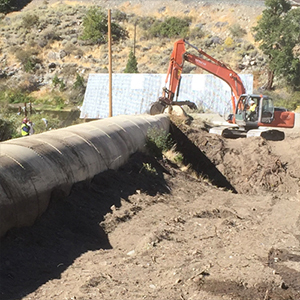 TMWA is working with a contractor to replace the steel penstock pipe that channels water from the wood flumes and forebay to the Fleish Hydroelectric Plant. The current penstock was installed in the 1930s to replace the redwood penstock that preceded it. Over the last eight decades the steal has gradually corroded to a point that, if left in service, a breach was becoming possible which could lead to damage in the hydro plant itself. The worksite, which is currently closed to the public throughout the duration of construction, is located approximately three miles west of Verdi and is visible from Interstate 80. The project consists of demolishing the existing 360-foot long riveted steel penstock pipe, and replacing it with a new 96-inch diameter penstock. The Work will include extensive excavation, steel pipe installation, lining and coating of the pipe, welding, concrete and gunite, and some electrical work. Also included are improvements to the Steamboat Ditch crossing, and miscellaneous site improvements. Work is expected to be complete in February of 2017. Commissioned in 1905, the Fleish Hydroelectric Plant houses a 2.5 Megawatt Westinghouse generator unit driven by a double horizontal Platt Iron Works Francis type turbine capable of developing 3400 Brake Horse Power while operating at 300 revolutions per minute. Approximately 327 cubic feet per second of water is utilized to turn the plant’s turbine. The overall water conveyance system including flumes, canal and tunnel that moves water from the Fleish head gates to the turbine is over 11,500 feet in length and creates a static head of 124 feet between the head gates and the turbine.